There are quite a few ways to upload files to SharePoint 2013, read on for three of the simplest ways to upload any file with no hassle. Drag & Drop is perhaps the simplest method to upload to SharePoint, save any document to a location on your computer that you can find easily then open the library you plan to save to within SharePoint, then simply drag the file from your computer over the library and it will save to SharePoint. Saving from Word can be an easy way to upload to SharePoint but may require some setup, if your computer has never saved to SharePoint before you will need to save to create a new document anywhere in SharePoint using the New Document button found in libraries and then saving to SharePoint anywhere by going to FILE > Save As > SharePoint, you should see the SP library you currently have open, save to this and your computer is set up. 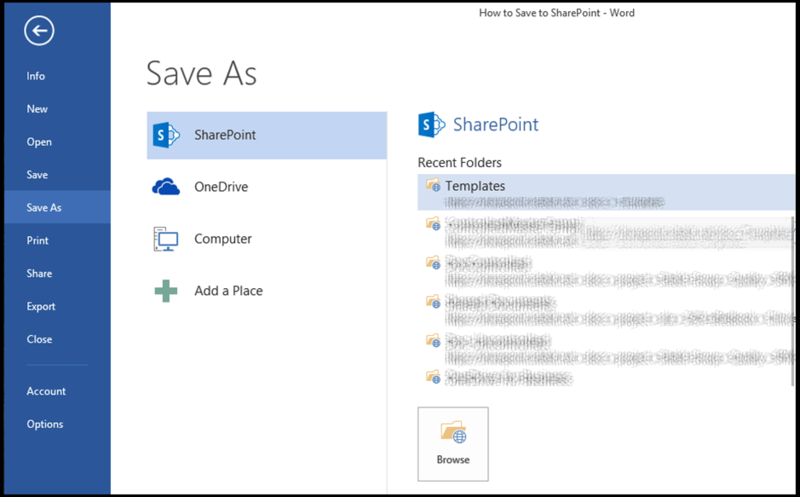 To save to SharePoint from then on simply go to FILE > Save As > SharePoint and it will display the SP library you currently have open. Uploading a document can be another simple way to save files to SharePoint, for this method go to the library you plan to save to and you will see just above the library itself some text which read “new document or drag files here” as shown below. Click new document and a pop-up similar to below will appear on the page asking you to browse for a file, you can either click browse and search for it or simply drag & drop the file into the choose a file field before clicking OK. I’d personally recommend this record in general as it allows you to easily update metadata before uploading and it means that users see exactly where the file is going.